Elizabeth from The Nail Hub!!!! I recently had the pleasure of meeting Elizabeth Morris (owner of Va Va Varnish in San Diego) creator and commentator behind The Nail Hub. I connected with Elizabeth on the level that we both feel strongly about us professionals being educated and sharing our knowledge and passion for the industry. 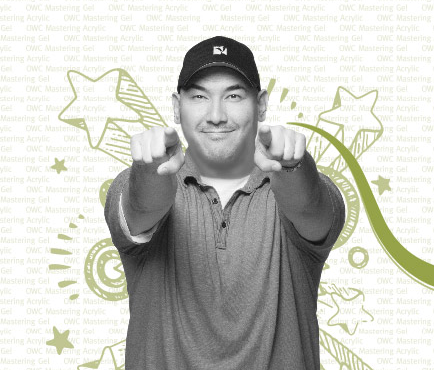 Also, to keep our industry standards at a high level so that we can show the world that we are professionals. Keep a eye out for some collaboration between Elizabeth and myself in the future. 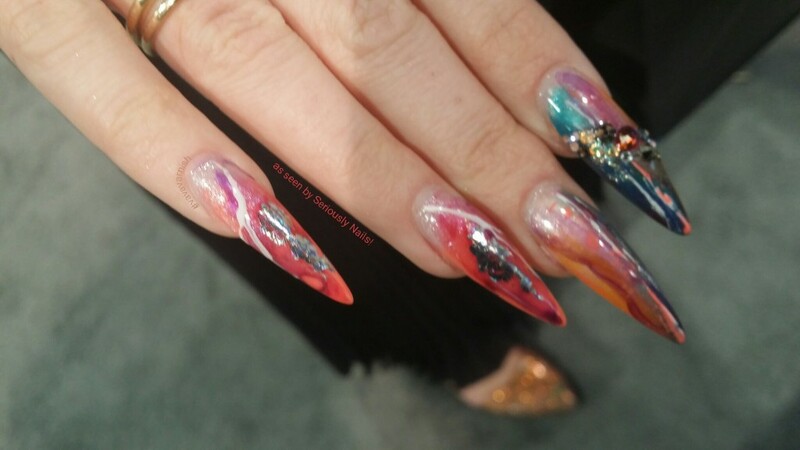 Here is Elizabeth’s nails that she wore to the IBS Las Vegas show this last weekend. 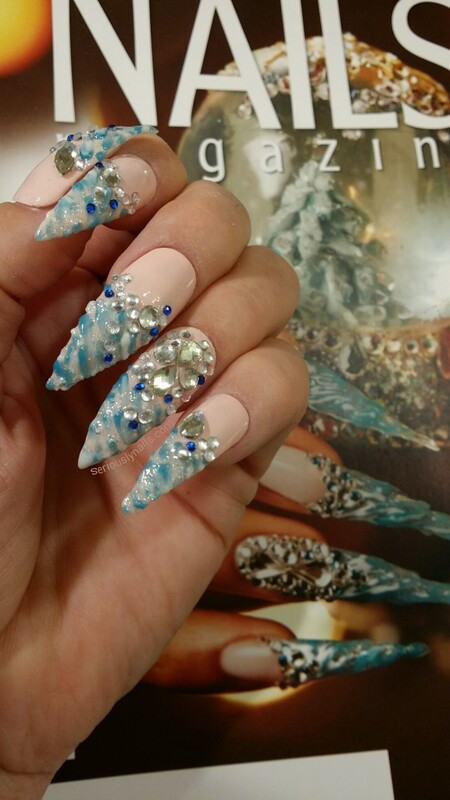 She extended her nails with Akzentz Pro-Formance Hard Gel and then created this gorgeous nail art using Akzentz Gel Play! Her gems are Swarovski and held in place with Akzentz Bling On! 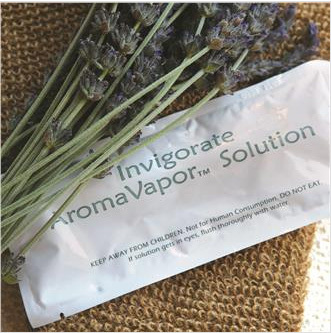 This company has some bomb products!!!! Nails by Elizabeth from Va Va Varnish using Akzentz Gel Play! Gorgeous! I love the underside of her nails as well. So chic! 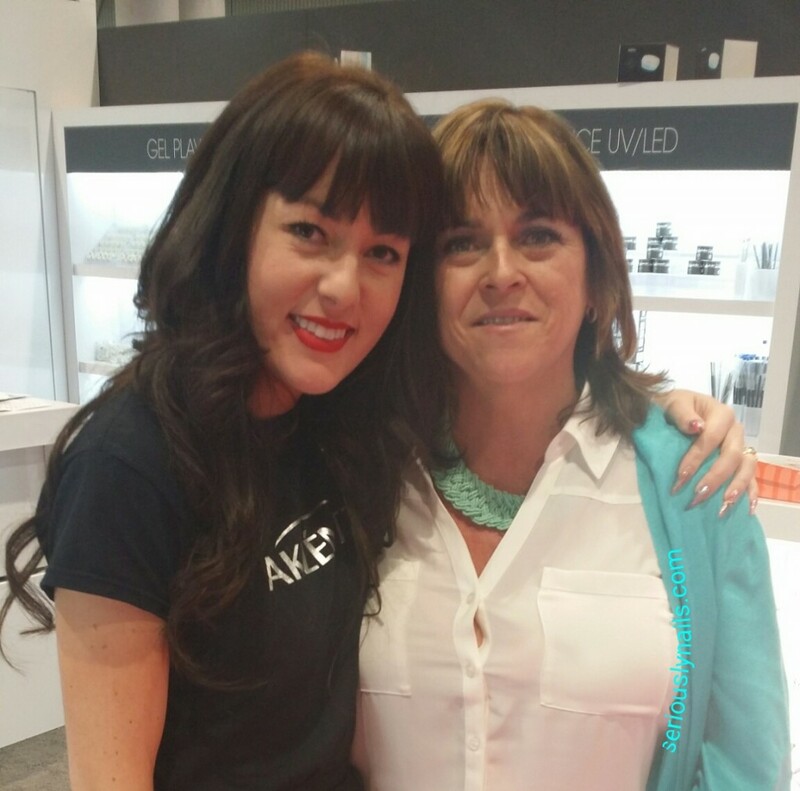 Elizabeth Morris from Va Va Varnish and The Nail Hub – working with Akzentz at IBS Las Vegas. Check out the undersides! LOVE! 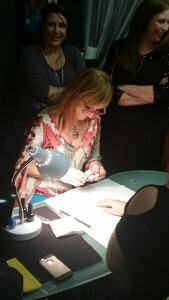 The above picture is of Elizabeth using Bling On to apply Swarovski gems to a attendee at the show. 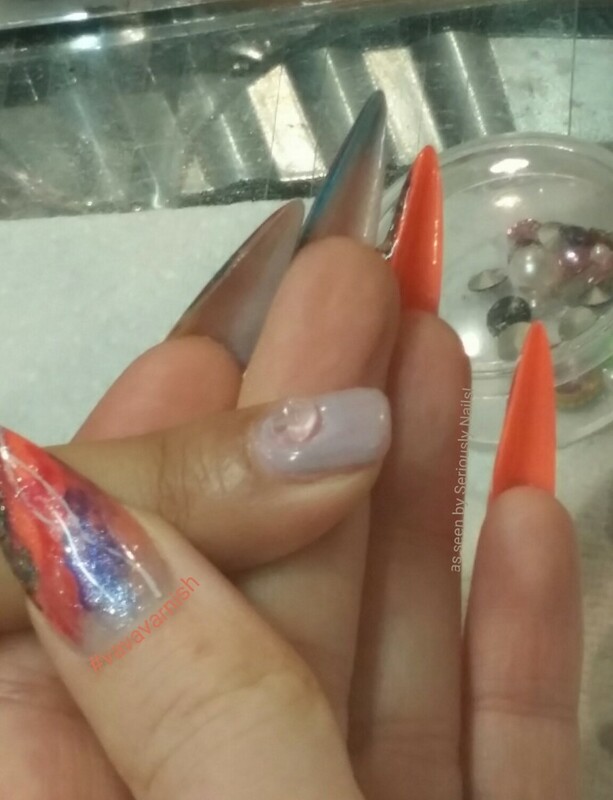 Many of you may have seen this before but no matter what, I believe it is a poignant reminder to all of us nail tech’s! 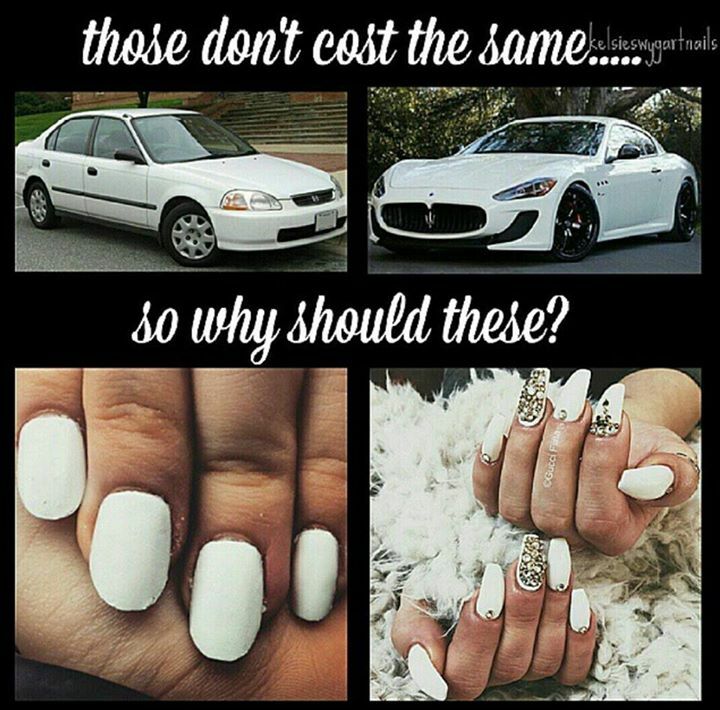 Especially for nail tech’s just starting out! Remember your worth. With a tag line like “If the star fits….wear it” you can’t help but recognize that this group is going to help you get places! I met the Profile girls at HRTE in Las Vegas this last month. 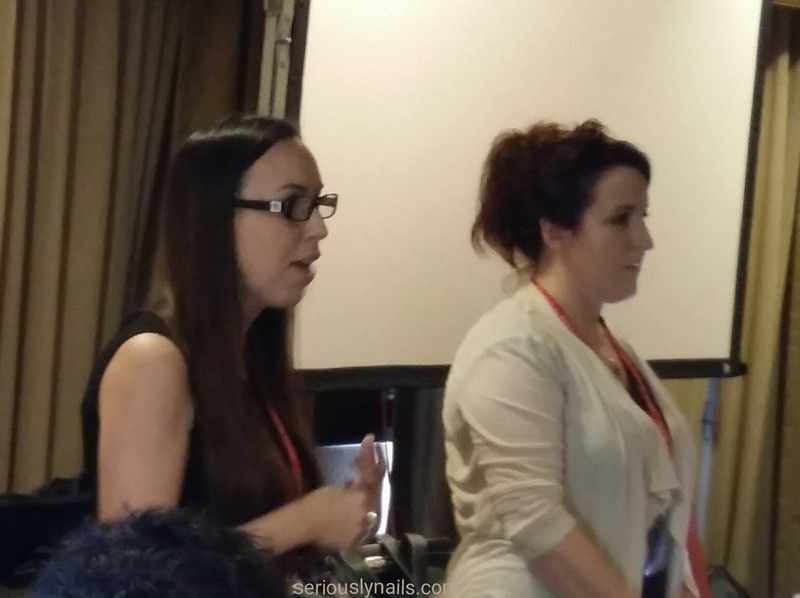 The girls were part of a group of people that spent two days educating other nail technicians about every thing from nail prep to legal issues in our industry. Traci and Ami! Pic from Nails Magazine. These girls (sisters by the way) have been in the industry for over 20 years. 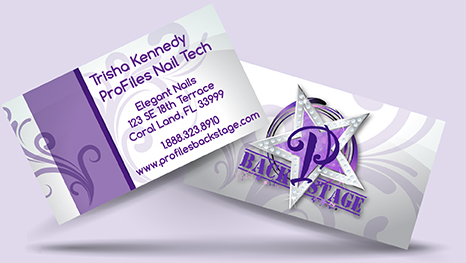 They have 5 locations for their salons with over 100 nail tech’s. All trained and mentored by the sisters so that the work is individual but of the same quality across the board. They have this other wonderful option for us professionals. Since they were continually asked “How do I become a Profiles girl?”, they created Profiles “Backstage”. 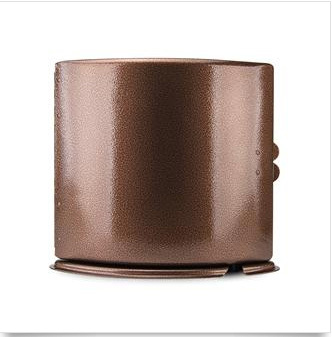 “Backstage” is a monthly subscription that gives you valuable information and products. As well as access to monthly video tutorials and 24/7 advice. These girls also help you brand yourself. With complete and customized templates to create stunning emails, newsletters, coupons, business cards, loyalty cards etc. They are deeply invested in the nail industry and know what works. After over 20 years of hands on, and with opening and franchising salons through Florida, these girls have good tricks up their sleeves. With “Backstage” access pass you get a inside track to this valuable information. monthly subscription includes “swag”, products, and laminated instructions with complete step by steps for the monthly design! 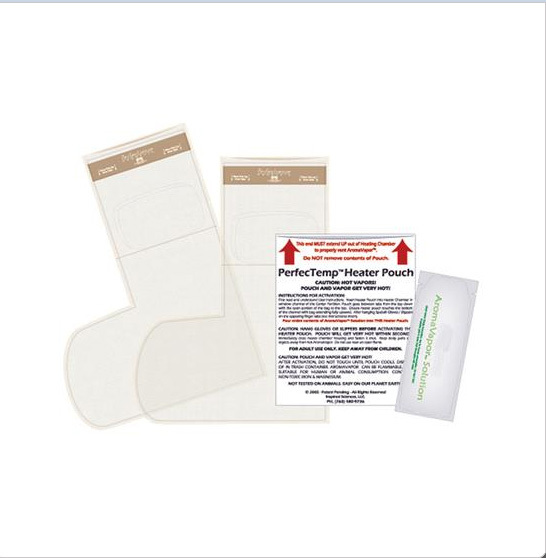 Also included in the cost ($29.95/month) of the “Backstage” pass is monthly kits that include product samples, seasonal colors and fun trendy design ideas. Along with a laminated card displaying the design idea and a simple step by step. Membership also includes salon referral on the Profiles Backstage Blog where you can write your own ad. This allows folks from all over the world to find you. 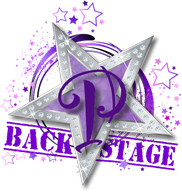 Get ready to reach the stars with the help of the sisters from Profiles Backstage. THIS WEEKEND IN LAS VEGAS!!!! YET ANOTHER EXCUSE TO COME TO FUN LAS VEGAS!!! This last Saturday, I received a email from Akzentz showing what was going on with them. A calender of events. Well, I got lucky because I saw that Gina Silvestro was going to be in Las Vegas for the High Road to Education event. Gina Silvestro, for those who don’t know, works with Akzentz and has been featured in Nails Magazine. Recently, on the cover. The High Road to Education is a two day event to being held here in Las Vegas. 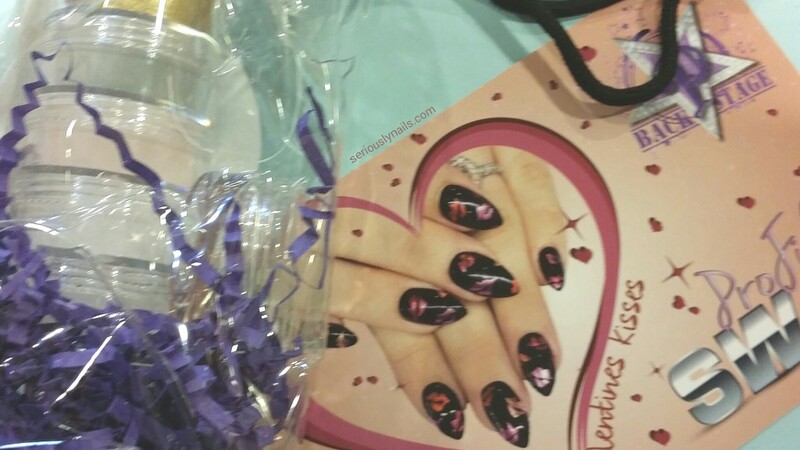 This event is non product specific and focuses more on basics of good nail care and technique. Created and hosted by Tammy Warner, HRTE is designed to be non product specific and to facilitate the coming together of like minded people. You can build your expertise, in part, by affiliating yourself with people who want to exceed in their profession. 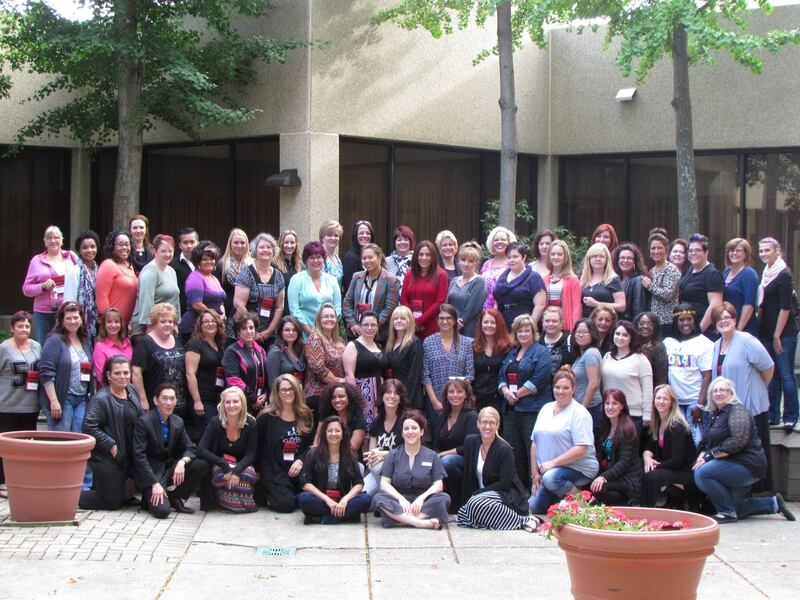 Continued education for nail techs is imperative in my opinion! 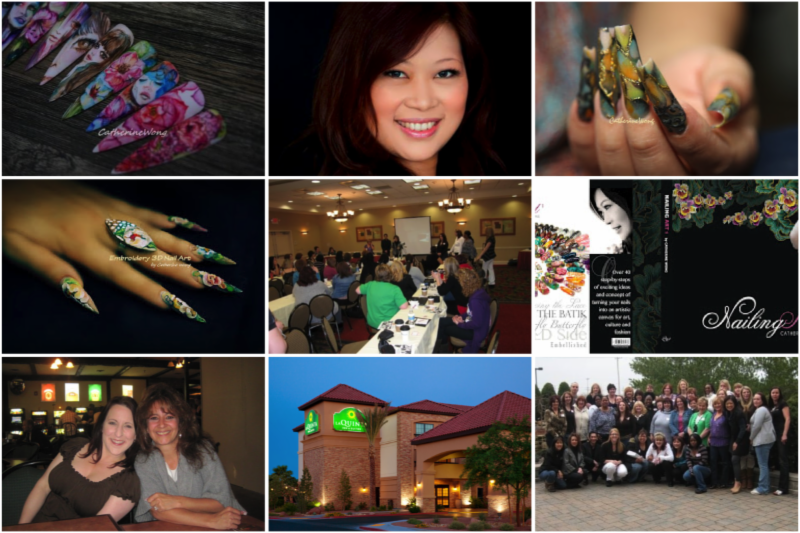 Licensed nail professional Tammy Warner has organized more than 20 HRTE events in various cities and countries, including Australia, Canada and Singapore. As well as two full days of education, I look forward to the networking of this event. Two days of learning from such greats as Gina and Catherine Wong. Catherine is coming to us all the way from Singapore! The other fine industry greats involved are Loni Preato, Traci Dungan, Ami McClure, Amy Becker and Jamie Schrabeck. Making their debuts are Tina Alberino and Max Estrada! What a great line up of talent for this upcoming event to be held March 15 & 16, 2015 at La Quinta Inn & Suites, 6560 Surrey St, Las Vegas NV 89119.